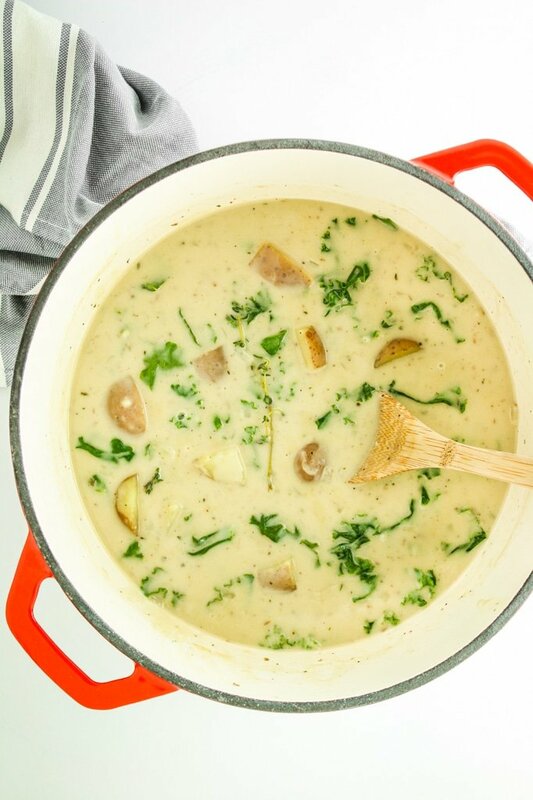 This dairy free potato kale soup recipe is creamy, rich, and incredibly flavorful. Using simple ingredients and just one pot, this soup comes together in under an hour on the stovetop. This soup right here. I don’t even know where to start. It’s out of this world. Tender new potatoes and wilted kale in the creamiest dairy-free base ever. All of it takes shape in one pot and with minimal clean-up. In a nutshell, this is comfort food perfection. In the 6 years that we’ve been blogging, we’ve made A LOT of recipes. 400-ish of which have made it to the blog and probably another 400 never made the cut. Every single recipe we share is special. There’s a lot of time and effort put into testing, photographing, editing, and writing before it ever gets posted. 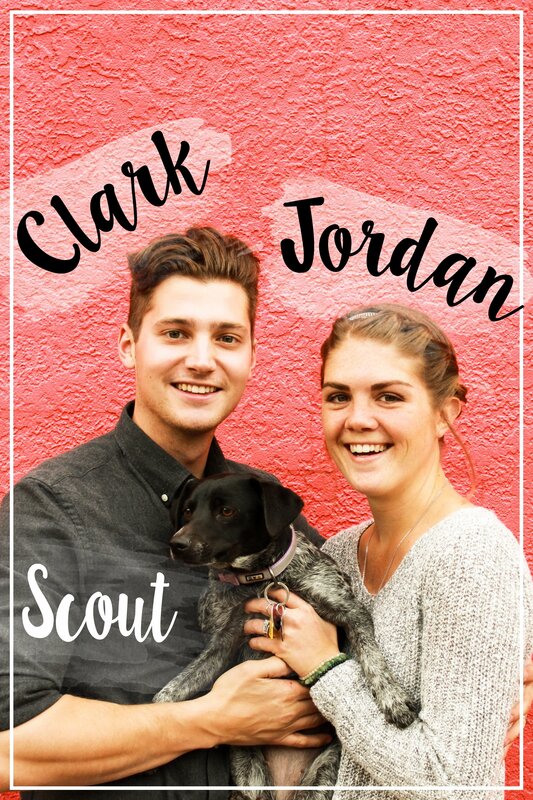 By the time it’s ready to post, I feel like it’s one of my “babies.” Then it’s released into the world wide interweb where it sinks or it swims.  Will you guys love it and make it over and over again? Will you think it tastes like crap or it’s too complicated to make? I could pull the good parent card and claim that I love every recipe equally. But that wouldn’t exaaaaaactly be true. I do love them all. But I definitely love some recipes more than others. This soup. It’s one of those recipes. So we didn’t make a single change to it. It was perfect on the very first try – and that’s something that *almost* never happens. ✨ I don’t need to ask questions or analyze why it worked so well. We’re just gonna give the credit to Clark’s memaw because this recipe was the first thing we cooked in the snazzy red pot she gifted us for Christmas. It’s as simple as that. Make it. Make it tonight, in fact. This soup is easy enough to make on a busy weeknight – from start to finish, it takes less than an hour. Then you’re cozying up with a warm bowl of your new favorite potato kale soup. Made from scratch, by you, with just a handful of simple ingredients and a pinch of magic. In a large pot, heat 2 Tablespoons of olive oil to medium low. Add onion and thyme. Sauté for 5 minutes until onion is softened. Add garlic and sauté 3 minutes. Add white wine vinegar and stir quickly to deglaze the pot. Add coconut milk, vegetable broth, potatoes, salt, and pepper. Bring to a boil and cook 5 minutes. Decrease heat to simmer and cover. Simmer for 20 minutes. Scoop out 2 cups of the soup from the pot and add to a blender. Give it a quick pulse, then pour back into the pot. Add kale and stir to combine. Cover and cook 5 minutes minutes until kale is tender and wilted. Serve it up with warm baguette, crispy coconut bacon, fresh herbs, or whatever you fancy – then enjoy! Combine tamari/soy sauce, maple syrup, pepper, and paprika in a small mason jar and shake well to combine. You could also whisk it together in a bowl, but I find the mason jar method so much easier! Add coconut shreds to a ziplock bag and pour in the liquid mixture. Shake well to make sure it’s all coated. Spread the shreds onto the baking sheet and place in the oven. Bake 15-20 minutes, tossing every 5 minutes. Do NOT overcook. They crisp up as they cool. We will definitely be making this again!! Question: Would it be ok to skip the blending? That’s one kitchen item on my list to buy. Hi Molly! I’ve never tried to skip the blending step. It does help create a creamy soup, but it may be fine without blending. I can’t say for certain since I’ve never tested it that way! YUM, YUM, YUM……SOOOOOO delicious. Thank you! What a beautiful bowl of soup! I can’t wait to try the recipe! Love this recipe. It looks and sounds amazing. The way you describe your love for this soup and your pics are really enticing! Ok you’ve convinced me. I’ll add this to my to do list. Can’t wait to try this out for myself! Yeah FINALLY a dairy free potato soup!! And I love that you used kale!! Sounds so amazing and I love the alterations you have made to this classic soup!! YES! It’s still so creamy and delicious, even without dairy. Oh, wow! 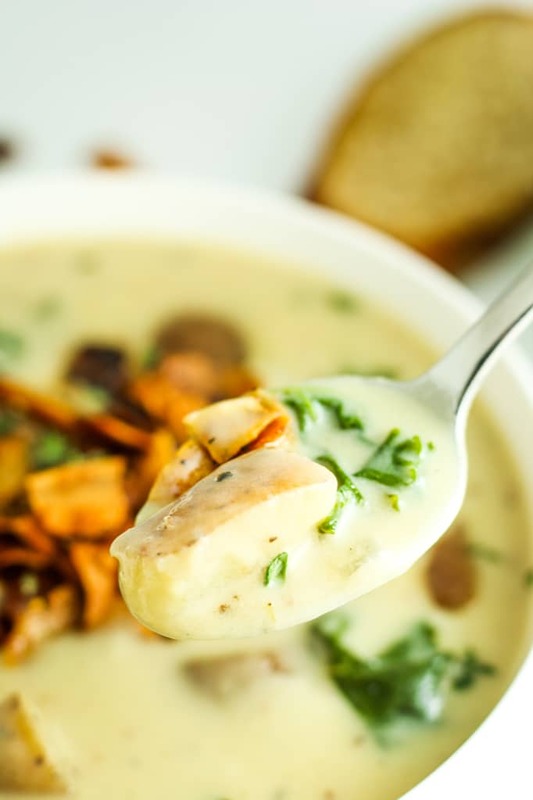 This soup looks so creamy and comforting and perfect for a winter dinner! 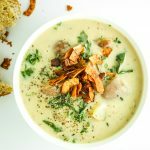 Not a big fan of potato soups but the combination of potato and coconut milk sounds interesting! I love coconut potato curry and something is telling me I am going to love this soup..
going to try out soon! I was in the same boat until I tried this soup. The base is so creamy and smooth, not gritty at all. Then there are chunks of tender potatoes and bits of kale for some texture. SO good. I cannot get over how delicious this soup looks! I can’t have potatoes so I think i’ll try making it with some rutabaga! That’s an awesome idea! I love rutabaga. The pictures are so good, I feel like having this soup right now! I do have a question though. The vegetable broth that you use – is it homemade or do you buy it. If it’s the latter, which brand? Thanks for posting this recipe. I use store-bought veggie broth! I haven’t tried making my own yet. I like Simple Truth’s and Pacific’s broths best. It rarely happens so YES it is magic! Dairy… not dairy…. it looks great. What a great looking soup! It sounds delicious and right now I need to warm up. This would be a tasty wasy to do it. This looks like a great, warm and hearty soup! Coconut bacon is a great idea! My husband to eat kale… he’ll never know! I’m loving your suggestion at using coconut milk! Brilliant! This recipe is great for people who don’t love greens. The kale gets super tender! Awwww… I bet mom’s was SO good! 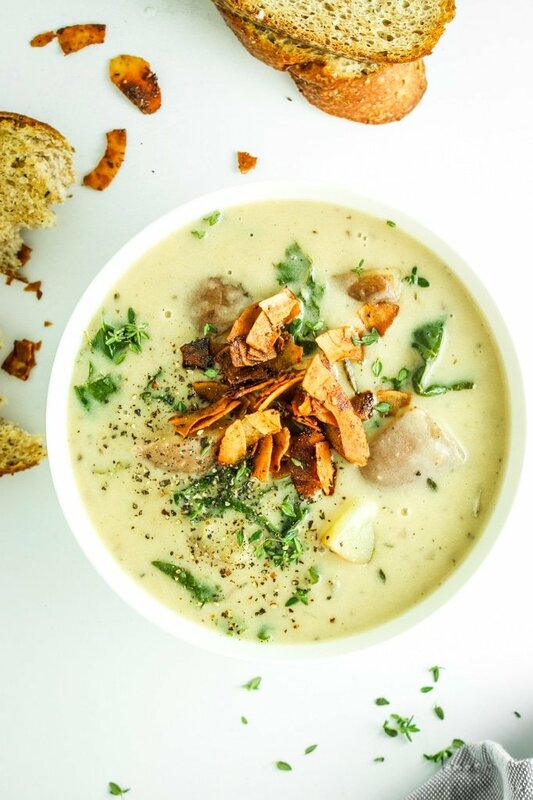 I love when creamy lookin soups like this don’t contain any dairy! This is perfection in cold weather. Yes! It makes them a million times better! Hello yumminess! This is a winter meal I can do. My husband loves soup, but brothy soups don’t make me feel great. I love rich ones like this! Agreed! 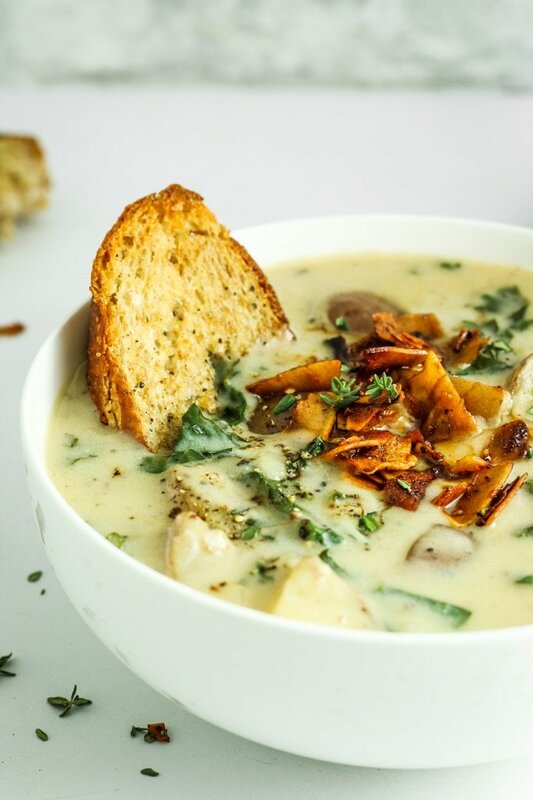 With this cold weather, creamy soups are a must! Why the heck have I never added make to my potato soup? Great idea!!! So cozy and with these temps all I crave is soup and comfort food! Love the addition of coconut bacon on top I bet the saltiness balances it out perfectly! Same here! 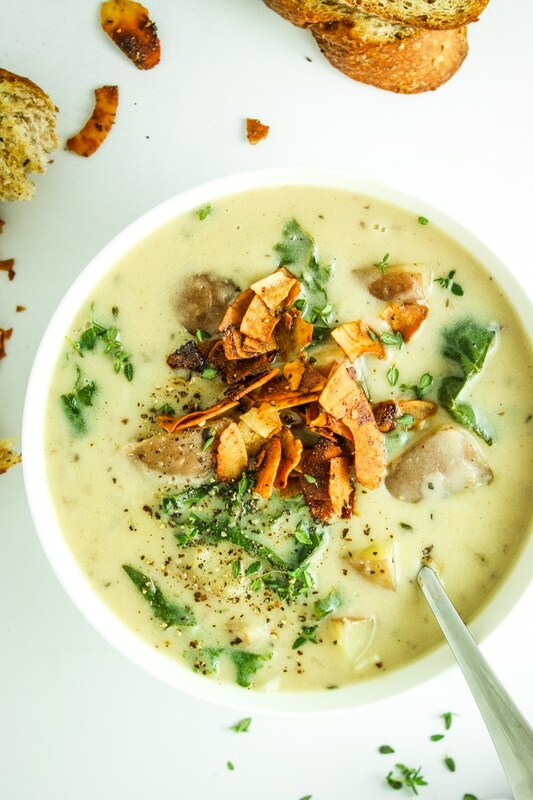 Give me alllll the soups all winter long. This ones looks pretty special to me! Sooo creamy! I can’t wait to try this, I’ve been loving all the soups lately! Recipe looks good but what are the calories? Hi Craig! I just fixed the recipe to reflect nutritional info. Thanks for the heads up – it was all inputted before I published but it disappeared!